We’re incredibly proud of our Scottish Heritage, inspired by the diverse land and seascapes for which Scotland is famed, Tartan Spirit blends those images into stunning contemporary creations that celebrate the country’s precious fabrics – Harris Tweed, Cashmere and Tartan. Those time-honoured cloths are fashioned into quirky combinations with touches of humour that materialise as highly desirable pieces that attract an ever-increasing international following. To read more about Tartan Spirit, click here. For the woman who thought she had everything – with a heady mixture of fun, creativity and pure style across a full range of silk, cashmere and fine wool tartan. Tartan Spirit brings you tartan dresses, kilts for the ladies, bags, scarves, Harris Tweed and tartan accessories like no other. 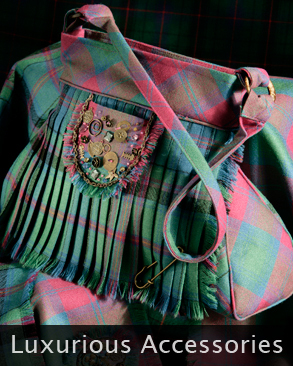 Be flamboyant in head to toe tartan, or simply discreet with a bag and corsage. 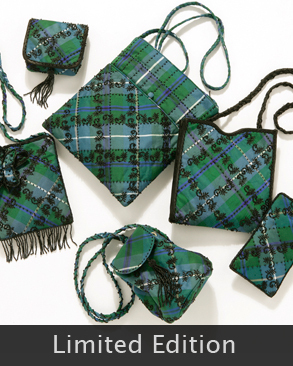 Tartan Spirit accessories make ideal gifts. Create a stir at the St Andrews party, sizzle at a Burns night and sparkle at Hogmanay!